Dairycon 2006 Exclusives, Part One! The Leader, PinchBottom, and Heffer! Quote: "History will be kind to me, for I intend to write it." Once a loyal soldier of the Predacon forces in the Beast Wars, The LEADER rejected his commander and quit the war. Stranded on prehistoric Earth with full knowledge of the future, he became the planet's guardian. 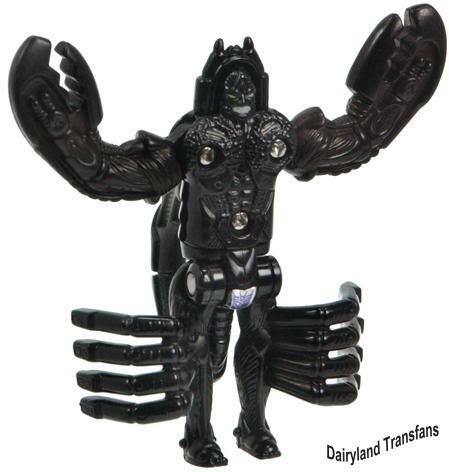 Whereas the Predacon leader Megatron and Tripredacus Agent Ravage tried to alter events at critical junctures in the timeline and effect large-scale changes, The LEADER'S methods are more subtle. He alters minor events over long stretches of time, thereby drawing no attention to himself or his plans. His final goals are unknown. While he certainly has his own secret agenda, it is also reasonable to assume that he has only the planet Earth's best interests at heart. Rebuilt over the eons, The LEADER now posesses the body of a standard-issue Decepticon foot soldier...all the more useful for infiltrating secret Decepticon lairs. 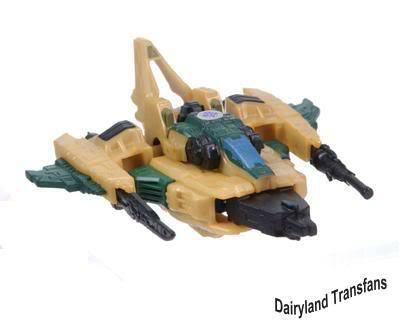 As such, he has the typical flying capabilities and weapons any ordinary Cybertronian-styled Decepticon seeker. He also possesses a seemingly inextingushable spark, perhaps due to interaction with a similar entity millenia before. 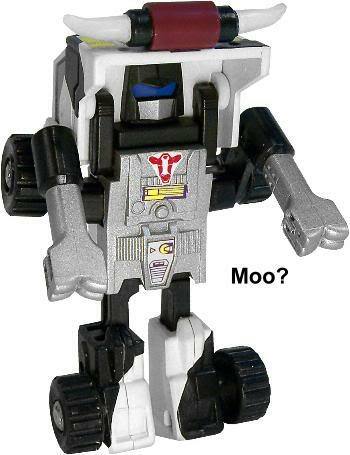 He can easily survive damage and injuries that would kill a normal Cybertronian. While the LEADER isn't stupid, he can be particularly naive and trusting at times. A being of sufficient cunning and persuasiveness can sway him. 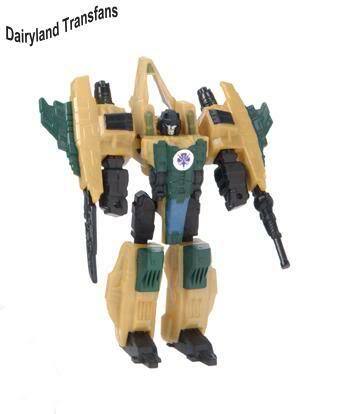 PINCHBOTTOM was once a respected Decepticon agent serving under the command of Shrapnel. That all changed when he was brought to Earth and discovered something that forever changed his destiny...the female backside. He cannot resist pinching the shapely bottom of an attractive young damsel. Mockingly called "Pinch-Pinch" by other Decepticons for the mantra he whispers to himself just before he "makes contact". Utterly useless while stationed around human beings. Occasionally takes trips to Vegas with Sunbeam to see the showgirls. PINCHBOTTOM can transform into a giant robotic scorpion, or shrink down to the size of a typical Earth-sized version. He can remain shrunk down in robot mode. His stinger is armed with mech-poison which causes the lubricants in his victims to thicken and coagulate. His claws can crush 10 cubic feet of reinforced concrete. PINCHBOTTOM is incapable of paying any attention to his job if in the presence of even a marginally attractive Earth female. He only dares to pinch their bottoms while shrunk down to insect size for fear of crushing them in his claws. Sometimes tries to pinch the bottoms of Cybertronian females, but their armor plating is too tough to be satisfying. They also tend to shove the barrel of their gun up HIS backside. A more recent addition to the ranks, Heffer is most often referred to as, "the last one off the Turnip Truck," (on the trip from the Dairycon Universe to Wisconsin). However, he is welcomed in the local taverns in the moo-state, and can always be counted on in a brawl. Heffer is not afraid to throw his weight around. As one of the stronger Dairycons, Heffer can haul up to 100000lbs, and knock over a freight train with one push. 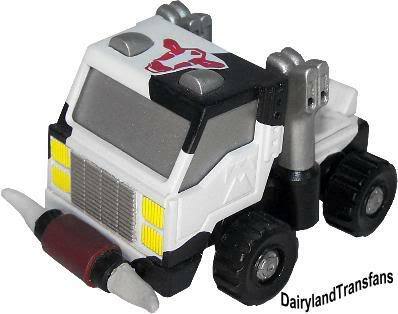 The Cow-catchers mounted on front in vehicle mode deflect the most intense artillary barrage. Heff-mounted weapons in hands allow him to bale hay or chew cud in the most dire of circumstances. As the least fuel-efficient of the Dairycons, Heffer is often, 'put out to pasture', and unable to go into battle. "The Wisconsin gas prices are just too high", says the gas-guzzling semi-truck. This has made him intolerant and bitter. Not even his old pal Uncle Whiskey Breath can cheer him up when he gets in one of those moods. Originally an art-contest entry, Heffer was soon featured in the ongoing Dairycon saga! The rumor is that Only 5 Heffers were produced(and raffled off at the convention). 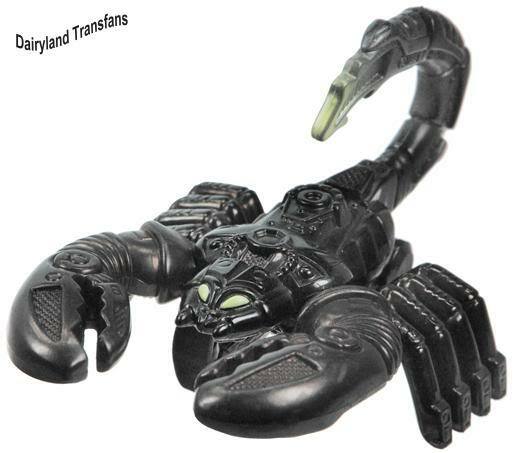 It was interesting to note that this toy *was* hinted at by use of the following page: Universe of Huffers. One wonders if there are *more* hints on that page.